Our historians in the research office have a lot of work that keeps them up for days at a time. They spend long hours diving into the nuances and complex contradictions, especially of the speculative worlds. It’s remarkable that they can put together anything solid when one canonical source claims that a Jedi’s lightsaber was green where another one assures us that it was blue, but the taskmasters keep a keen eye on them to make sure that they stick to the job at hand. Authenticity is crucial for us. So, you’d think that when they finally had a break from the rough boat of research that we threw at them that they might distract themselves with something as unrelated to historical details as possible. But, instead, several of them go into researching one of America’s favorite historical events: World War II. We can’t blame them. There are a lot of incredibly interesting details to unearth and we’re not even talking about imaginary worlds, this time! Film and TV agree, offering us a ton of fantastic stories all set amidst the backdrop of one—if not the—most impactful events of our world. So, it is no surprise that they’ve slipped several inventory demands for vintage-looking regalia of the World War II era. Can’t blame them for that, either! Stepping into a clean set of World War II inspired uniforms in order to both honor the Veterans that fought for the world back in the ‘40s while also looking incredibly dashing is an experience that everyone should be able to have. It is for that and many other reasons that we’re happy to help you take on that very same temporal transformation by stepping into this WW2 Army costume. 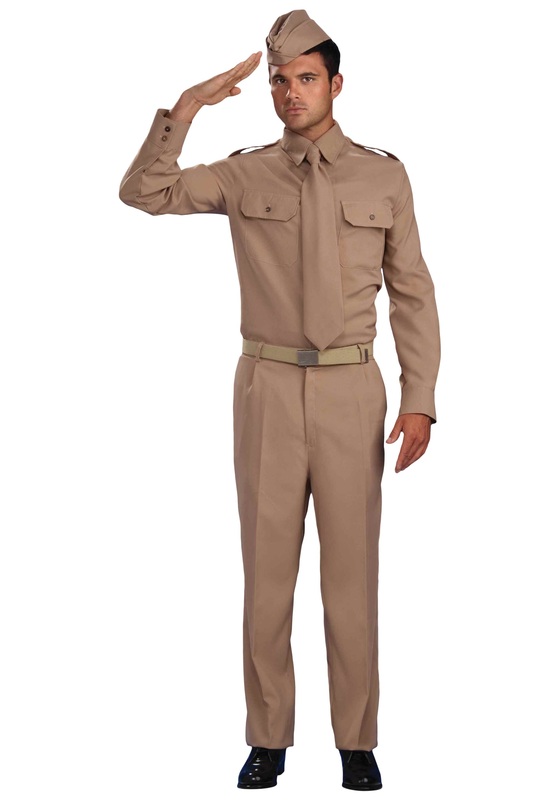 The vintage military drapes begin with a tan tinted polyester long sleeve, button up shirt with front breast pockets and matching button and zip up trousers. The traditional World War II Army hat and matching tie make up the simple but elegant uniform that sends you back into this honored past. Couple the uniform with some stylish black shoes—and don’t forget to polish them—and additional vintage weaponry and you’ll be the very hero that your favorite 1940s pinup girl has been asking for!